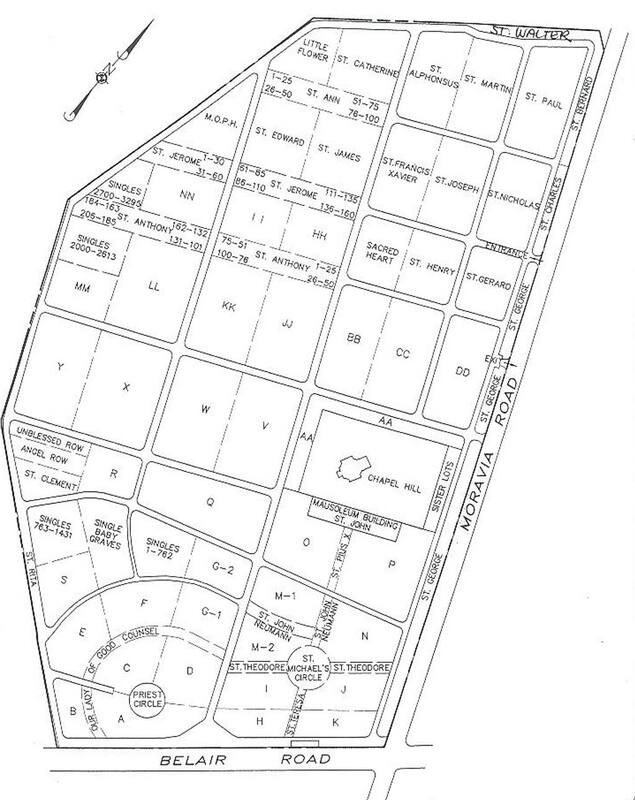 The Redemptorists were authorized to open a cemetery of about sixty acres near the Gardenville section of Baltimore County, on May 3, 1882, by the Maryland House of Delegates. 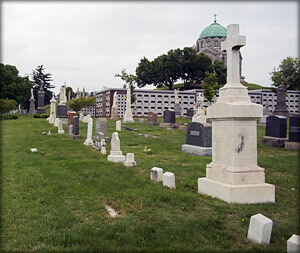 On October 1 of that year, the plot formerly known as St. James Catholic Cemetery, which had been interring the deceased since August 1880, was thereafter designated the “Catholic Cemetery of the Most Holy Redeemer,” when an agreement was struck between the parish communities of St. James the Less and St. Michael the Archangel to conjointly control and manage it. It is bounded by Moravia and Belair Roads and North Avenue. The central office for Most Holy Redeemer was located in the parish church of St. James the Less on East Eager Street whose pastors were for many years the presidents of the cemetery corporation. Today, records are kept at the office of Sacred Heart of Jesus Cemetery. The most predominant feature of Most Holy Redeemer Cemetery is the Furst Chapel, situated on the Chapel Hill section of the cemetery. The chapel was donated by Mr. and Mrs. Frank A. Furst and they are entombed therein, together with 61 Redemptorist confreres whose remains were transferred in 1978 from the Redemptorist cemetery at Ilchester, Maryland, where the Order’s novitiate had been for decades. Generations of Redemptorists are also buried in the priests’ circle. Among its notable inhabitants, Most Holy Redeemer is home to Henry Gunther, the last casualty of World War I and Catherine Ruth, mother of Babe Ruth. The cemetery still has plenty of in-ground spaces available, as well as mausoleum crypt and niche spaces. The Furst Memorial Chapel—a gift of Mr. and Mrs. Frank A. Furst,is among the additions to an already bucolic setting. The couple is entombed therein, together with 61 Redemptorist confreres whose remains were transferred in 1978 from the Redemptorist cemetery at Ilchester, Maryland, where the order’s novitiate had been for decades. Generations of Redemptorists are also buried in the priests’ circle. The Chapel was dedicated May 30, 1917, by the Most Rev. Owen B. Corrigan, Auxiliary Bishop of Baltimore, who consecrated the interior altar the following day. A vast parade of the city’s cadet corps escorted the prelate and the combined audience of clergy and onlookers for the subsequent field Mass numbered 15,000 people. 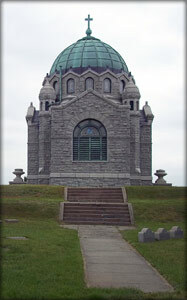 At the time, the Chapel ranked as one of the largest mausoleums built by a private citizen in the United States and was erected in honor of the Redemptorists who had assisted Mr. Furst from an impoverished boyhood and into prosperity. A devout Baltimore Catholic, Francis E. Tormey, was the architect; Monmonier and Sorrel were the builders. Statuary was supplied by Mullan Harrison, Co., and the windows were executed by the Gettier Studios, both of Baltimore. Until recently, Masses were held in the space on special occasions such as All Souls Day. It is hoped that we will soon be able to restore the entire Chapel to its original beauty. A one page map of Most Holy Redeemer. To find the resting place for a loved one, please stop by our office for assistance.